Looking for discounts? Get free BazaarCart coupons and deals to save up to 75%. Click to activate the code and start saving now!!! Enjoy Free home delivery for purchases of ₹500 and above. Valid for a limited period only. Buy earrings, precious jewellery, fancy jewellery, rings and much more and take up to 40% discount ton your shopping. Get your favourite ones before they are gone. Subscribe for sparkling news from bazaar cart and receive exclusive offers. The newsletter is published every month, announcing product launches, promotions, events, trends and much more. Buy a variety of pulses like arhar, chana, masoor, moong and many more and get up to 25% discount. Choose from major brands such as Rajdhani, Mangat Ram, Tata I-Shakti, Loose and more. Get 15% cashback on every 3rd transaction. Minimum transaction value ₹300. Maximum cashback is ₹150. User is eligible for cashback on 3rd, 6th, 9th & 12th transaction. All full/ partial refunded transactions would not be considered in the eligible transaction list. Transactions less than minimum amount would not be considered in the eligible transaction list. Validity 01/08/2016 - 30/09/2016. Offer is valid 4 Times Between start date to End Date. Get up to 30% off on masala & spices. You can shop for entire range of spices, cumin, curry powders, dry ginger, dry red chilly, elaichi, anise, cardamom, chat masala, chatni, black pepper and lots more. Buy Now! Get up to 20% off on Catch masala. Shop for Catch King, Garam, Rajma, Sahi Paneer and all types spices online shopping at Bazaar Cart. Hurry! Buy ‪‎Deodorant‬ & Perfume and get up to 50% off only on BazaarCart. Shop online from wide range of Fragrances, Perfumes from top brands like Davidoff, Adidas, Axe, Nivea, Old Spice, Wild Stone and more. Get up to 80% off on mobile covers. Select from the best range of mobile covers, mobile cases at BazaarCart. Buy Now! Save up to 45% on home and kitchen appliances and essentials like hangers, casseroles, lunch boxes, containers & bottles, dinner & crockery ware, stool & basket, bucket & dustbin, etc. in this link. Limited period only. Shop online for Haldiram products include frozen foods such as frozen meals, ice cream and kulfi, sweets, cookies, crackers, sherbet, papad, savories, chips and other snacks. Avail flat 10% discount. Hurry! Take away up to 80% off on special rice varieties from famous brands like Kohinoor, India Gate, Best, Daawat Rozana, Fortune, Elina, Bemisal, PAN etc. from this page. Shop Now. Get up to 55% off on cushion/diwan set covers from RajasthaniKart Traditional Diwan-e-Khas set pieces, starting at just ₹549 onwards. Buy Now. Feel Refreshed this Summer! Avail flat 30% discount on Rehan Sharbat of different succulent flavours like mint lime, honey lime, traditional taste etc. in this link. Also, get Real brand Guava Juice 200ml at just ₹17 only. Order Now! Shop & avail up to 55% off on Gaurav Agarbattis. A huge variety of incense sticks and dhoop available on the page. Buy Now. Buy ‪women‬ accessories products and get up to 70% discount only on BazaarCart. Select from a entire range of necklace & pendant, earrings, rings, brushes & applicators, bracelts & bangles and more. No coupon code required to avail this offer. Buy anti dandruff shampoo, herbal shampoo, Shampoo for dry hair online at up to 20% discount. You can buy Dove Shampoo, Park Avenue Shampoo, Sunsilk shampoo and more. Limited period offer. Guess the Lightly Toasted Breakfast Product By Kellogg's! Get up to 5% off on breakfast cereals + Pay with Mobikwik and get 10% cashback only on BazaarCart. Shop for Jam products at BazaarCart and grab up to 25% off. No need to use any coupon code. Hurry! Get up to 70% off on Bollywood Sarees. Shop by type like Silk, Banarasi, Cotton, Chiffon, Georgette, Embroidery, Bandhej, Lehenga Saree, Wedding and more. Pay Cash on Delivery. Grab this offer. Buy Hi-tech products online at up to 25% discount from BazaarCart and get free home delivery. Buy tie, belt & wallet for men online avail up to 70% discount only at BazaarCart. No coupon code required. Shop at BazaarCart and avail up to 25% discount on pickles. 100% Quality Products and Free Shipping. Hurry! Limited period only. Enjoy‬ this Summer With BazaarCart! Get up to 25% discount on juices and drinks. No coupon code is required. Get highest 25% discount on Oral care products like mouthwash, brush, tooth paste etc. only at BazaarCart. Grab now! Buy Mcvities biscuits and cookies online and avail up to 20% discount. Mcvities Digestive Biscuit No Added Sugar. Hurry! Limited period only. Shop and get up to 55% discount on dhoop & agarbatti products only at BazaarCart. No coupon code required. Grab it now. BazaarCart offers up to 30% discount on home and cleaning products like floor, toilet & surface cleaner, wiper, and more. Buy food items from one of the leading brands Bikaji and get up to 15% discount. Get papad, namkeen, chips, cookies, fried patties and a lot more at reasonable prices. Shop Gaurav products such as incense sticks, dhoop, match box and more products and get up to 35% discount. Limited quantities. Place your order now. Buy formal shoes at Bazaarcart and get up to 50% off. Hurry Up! Avail this offer before it expires, click to visit special landing page. No coupon code required. 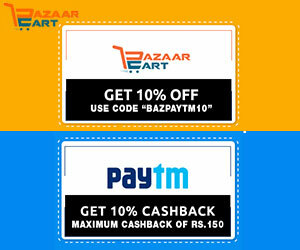 Buy women clothing and get up to 90% off at Bazaarcart. Click here to grab this offer before it expires and click to visit special landing page. No coupon code required. Buy Catch masala and get up to 25% off at BazaarCart. No coupon code required. Discount will be automatically calculated after adding products to the cart. Buy pan brand grocery and spices and get up to 48% off. Offer valid on selected pan brand spices only. Hurry Up! Avail this offer before it expires, click to visit special landing page. No coupon code required. Get up to 70% off on special rice varieties from famous brands like Kohinoor, India Gate, Best, Daawat Rozana, Fortune, Elina, Bemisal, PAN etc. from this page. No coupon code required. Discount will be automatically calculated after adding products to the cart. Take advantage of this amazing offer and grab 60% discount on wallet. Click here to grab this offer before it expires and click to visit special landing page. No coupon code required. Now take up to 40% discount on aluminium foils. Click here to grab this offer before it expires and click to visit special landing page. No coupon code required. Avail this limited time offer and grab up to 60% discount on dry fruits. Hurry Up! Avail this offer before it expires, click to visit special landing page. No coupon code required. Enjoy up to 70% discount on various products such as dry fruits, packed fruits, rice, vermicili and many other. No promo code required. Celebrate EID with discount on best quality products. Shop a variety of spices such as masala chole, amchur powder, masala sambhar, deggi mirch and more at Bazaar Cart and receive up to 25% off on your purchase. Offer valid while the supply lasts. Grab up to 60% Off On Nayasa Home & Kitchen Appliances at BazaarCart. Click here to grab this offer before it expires and click to visit special landing page. No coupon code required. Order hi-tech pulses like arhar, urad dal, mix dal, chana dal, rajma and more and get up to 15% discount on your order. No promo code required. Buy a variety of pickles from flavors such as green chili, lime, khatta mitha, garlic and many more and get up to 25% discount. Choose from major brands such as Keya, Sanjeev Kapoor Khazana, Tops and more. Shop corn flakes, oats and muesli from Kelloggs, Bagrry, Post and more brands and receive up to 20% discount. No coupon code required. Just click and activate the deal. Checkout the latest collection of mobile cases and covers and receive up to 50% off on order. Grab the offer with no coupon code required. Order a variety of Tops products like chilli sauce, vinegar, vermicelli, jam, custard and many more items and receive 5% discount on your order. No promo code required. Choose Ramdev patanjali products from a wide range such as for home needs, oral care, washing needs, face care, hair care, flours and grains and many more categories starting at just ₹3. Shop pulses, dalia, maida, suji and many other items form Pan brand and save up to 48% on your purchase. Take the benefit without the need of the coupon code. Order various beverages categorized as water and soda beverages, drinks, tea and coffee and milk from major brands such as Tropicana, Amul, Abbott, Cadbury and more and get up to 15% off. Browse through the variety of formal shoes for men and enjoy up to 35% discount on your shopping. Also buy shoe care products along with your order.